The new Dacia Sandero Stepway Diesel Hatchback is essentially a tough cookie supermini that wants to be an SUV. It’s spacious, affordable to run – and its prices start from under £9,000. The cynics will argue that it’s too cheap, while bargain hunters will already be halfway through this review. But what’s worth pointing out is that this is an enhanced version of the Sandero, another budget car that’s already proven popular. It’s also just as stylish and spacious as crossovers that cost a lot more to buy. Dacia started as a Communist state-owned company, they’ve come a long way since then. Read our article about Dacia’s history. Join OSV as we take a closer look at what it’s all about with our 2018 Dacia Sandero Stepway Diesel Hatchback review. Provided you aren’t in a massive hurry, the Stepway is a pretty relaxing way to get from A to B and back. That said, there are caveats. Its elevated suspension setup means that body lean is a bit of an issue through bends, while the front wheels take a while to respond to steering inputs. It’s also quite loud and it isn’t an off-roader, despite its raised suspension and the fact that it’s a more rugged version of the Sandero. Moreover, its steering seems overly heavy, which proves to be a bit of an issue in the towns and cities. Keep the car in a straight line and you’ll be okay. It’s composed, quiet, smooth and even comfortable. In fact, it’s a lot quieter and comfortable than we’d expect a car at this price point to be. In short, the way the car performs on the road can best be described as decent. It’s not exciting – although a 0.9-litre petrol engine is kinda fun – but, for this kind of money, it would take a really bad day before you complain about the way the ever-willing Sandero Stepway drives. In terms of the diesel engines, there’s just one available. It’s a 1.5-litre dCi 90 unit that can get you from a standstill to 62mph in 12.1 seconds before maxing out at 108mph. It’s a punchier engine than the petrol and offers more flexibility. It’s especially useful on the motorway, where it feels less strained than the petrol. It’s noisy, however, and you’re always aware of how hard you’re pushing it. Before you step inside the car, it’s well worth remembering that this is a budget-friendly Hatchback. It’s basic – but it’s not too bad at all. We have no complaints where comfort is concerned, with its suspension setup doing a great job of smoothing out most road surfaces. Dive into corners at speed, however, and excess body lean can be off-putting. The cabin is robust and should stand up well to the demands of family life on the road, but it’s far from luxurious. However, a recent facelift means the car now gets lashings of satin chrome, a brand new four-spoke steering wheel and 3D weave upholstery. Is the Dacia Sandero Stepway Diesel Hatchback practical? Its elevated suspension setup is one of the things that distinguishes it from the standard model, and it makes it easier for you to load your bags into the boot. The dashboard is as basic as basic does, but it has everything you need. To that end, it’s got a temperature gauge, a fuel gauge, a rev counter, a speedometer and so on. It also has switches for the indicators, wipers and lights – but not much else. It’s logically arranged, at least, and very user-friendly. The boot in question measures 320-litres and can be increased to 1,200 by folding the rear seats. Other than that, the driver and their passenger have plenty of room up front, and anyone sat in the back should be satisfied with the room on offer. In fact, there should be more than enough room for 3 adults to sit side by side back there. Access is easy, while cabin storage is adequate but not brilliant. Standard kit is poor if you stick to the entry level Ambiance trim. It comes with air conditioning but very little else. The rear windows are manual, although it does come with Bluetooth as standard. The Laureate model sits at the top of the range and is much better equipped. 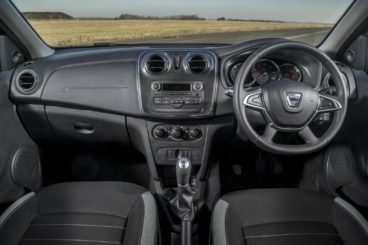 It comes with a touchscreen sat nav, a MediaNav Evolution Multimedia system, a trip computer, electric door mirrors, a height-adjustable driver’s seat and cruise control. In terms of how safe the car is, the Stepway model has yet to be crash tested by Euro NCAP, but when the standard Sandero was put through its paces, it scored only 3/5. That’s disappointing, especially when most of its rivals are scoring 5/5. This is a tougher model, though, and standard safety kit here isn’t too bad; it includes anti-lock brakes, traction control and electronic stability control. Prices for the new car start out from £8,995 and rise to £12,595. For more information on our leasing deals, you can check out our page here. In terms of its running costs, the Sandero Stepway’s Renault-based engines are all cheap to run, but it’s the sole diesel that’s the most frugal. This 1.5-litre power plant can return as much as 74.3mpg on a good day and emits less than 100g/km of CO2. And by ‘a good day’ we mean those days when you’re taking it easy in the towns and cities. The diesel is also the stand-out choice if you’re a high mileage driver who’ll be using the motorway a lot. Insurance-wise, the diesel model sits in group 10 out of 50. 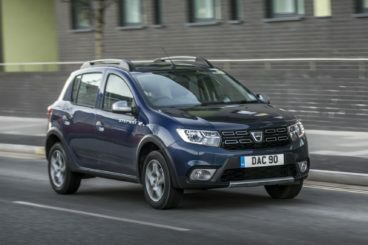 Are Dacia cars reliable? Read our honest and unbiased assessment of the brand. You can pick up one of these for less than £9,000, and the diesel engine is also super affordable to run. The diesel unit might be cheap to buy, run and insure, but it’s also got plenty of punch and works well as a high-speed cruiser. This is essentially the more practical version of the Sandero. It boasts a spacious interior and its boot extends to 1,200-litres when you fold the rear seats. Heavy steering can make the car a chore to drive in the city, and it isn’t the most fun car you’ll ever own. Let’s see how the car compares against its rivals in the comparison section of our 2018 Dacia Sandero Stepway Diesel Hatchback review. The new Nissan Juke Diesel is gorgeously styled, well put-together, and still seems funky fresh despite having been around for so long already. On the road, the Juke isn’t as fun as it looks. That’s a shame, but it’s still got lots of good things going for it. Its steering is nice and responsive, its engines are pretty perky and it’s mostly comfortable (though you’ll know about it if you come across some badly scarred roads). Handling is decent too, while body lean is well resisted. Caveats? The light steering prevents you from getting too involved in the driving experience, while engine noise is an issue. Speaking of the engines, there’s just the one diesel to choose from. This is a turbocharged 1.5-litre dCi unit that completes the 0-62 sprint in an acceptable 11.2 seconds. Its burst of acceleration suits the car well, but our biggest concern is that it’s probably going to be too noisy for most people. To drown it out, the radio will have to go right up. Running costs? 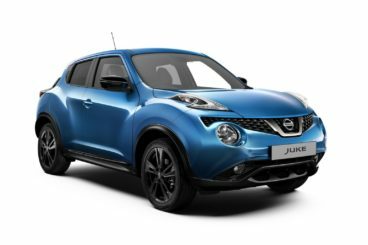 The sole diesel is the cheapest engine to run in the Juke’s range and can return 70.6mpg economy. Inside, buyers will probably notice two things immediately: The car’s funky design and its low rent plastics. It’s a shame that Nissan chose to adorn it with poor quality materials because, design-wise, the Juke stands out from the crowd. The centre console comes in different colours and there are plenty of stylish touches here and there. The hard, thin plastic from which the dashboard is made is unappealing, as is the old radio and CD player that the lower-spec models have to make do with. Meanwhile, the steering wheel can’t adjust backwards and forwards. Is the Nissan Juke Diesel practical? Its boot is bigger than last time and now measures 354-litres. That’s much better, although four-wheel-drive models still get a smaller boot. And although its boot is bigger than the Dacia’s, there are rivals who can boast larger boots. Overall, interior space is a bit lacking. The roofline slopes badly and it impinges on rear headroom. The back seats are fine for children but not really anyone else. The new Fiat Panda Trekking is a lot of things, but let’s make this clear straight away: This isn’t a 4×4. Instead, it’s a tough supermini that’s great fun to drive. It sports a macho image, but front-wheel-drive keeps its feet on the ground and its engines are more perky than beefy. That said, it comes with uprated traction control which does give it a bit of off-road prowess. In terms of its engines, there are just two to choose from – a 1.3-litre diesel and a 900CC Twin Air petrol engine. We prefer the latter because it has more characterful, but both engines are a good fit. They also suit the car in the towns and cities, where it comes into its own. Light steering and an elevated driving position ensure that it’s easy to drive, but things aren’t quite as simple on the open road. Its skinny tyres don’t deliver enough grip, there’s a lot of body roll and not much feel from the steering. Running costs? The Panda Trekking overall isn’t as economical as we expected. It’s got two-wheel-drive and a pair of small capacity, two-cylinder engines, but the petrol variant returns 40.5mpg at best. On the other hand, the diesel variant should be good for 67 mpg on a good day. Inside, the Fiat is boldly designed inside and out. As ever with the Panda, it gets so-called squircle styling cues, and it feels more upmarket than the Stepway on the whole. However, there is still ample evidence of harder plastics here and there, and a height adjustable driver’s seat isn’t standard (although it costs just £50). 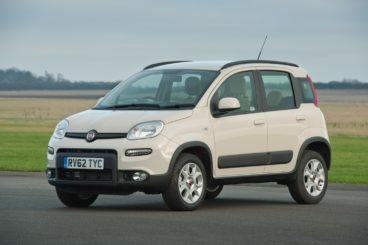 Is the Fiat Panda Trekking practical? Its tall, boxy shape means there’s plenty of space inside, and we don’t think anyone – upfront or in the back – will be complaining about leg or headroom. There’s also lots of storage spaces dotted around the place, but the boot measures a rather measly 225-litres. If you want low costs, lots of interior space and a fairly easy-going driving experience, it’s going to be hard to look past this car. It’s cheaper than its rivals by some distance but can offer just as much ruggedness and practicality. It’s hardly premium, but the brand new Dacia Sandero Stepway Diesel Hatchback is a very commendable effort from the brand.